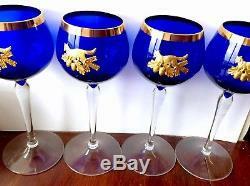 Vintage set of four blue bowl wine glasses with gold tone/plated applied foxes with acorns & oak leaves & gold gilding around the rim. The fox motif measures approx 26x38mm. The glasses are approx 19cm high. The diameter at the rim is approx 6.5cm. These are in good condition with no wear to the gilding. 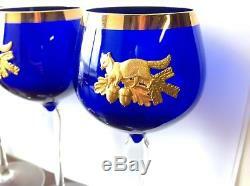 The item "Beautiful Vintage Set Fox Hunting Cobalt Blue Wine Glasses Applied Gold" is in sale since Wednesday, July 26, 2017. 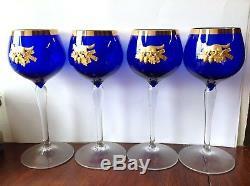 This item is in the category "Pottery, Porcelain & Glass\Glass\Glassware\Cobalt". The seller is "ningsthings" and is located in Rogart, Highland.